While we know that TVS Apache RTR 160 and the RTR 180 is doing well on monthly sales charts and are one of the most successful products from TVS Motor, the company is expected to launch the TVS Apache RTR 200 in India. The launch of all new TVS Apache RTR 200 would likely happen in coming few months. The Apache RTR 200 was first expected to be revealed in the month of November and was also spotted testing on various occasions. Sources like CarBlogIndia have reported that the new RTR 200 could be launched on January 20 of this year. This new bike is also expected to be showcased at the Auto Expo 2016. The spy images of new TVS Apache 200cc reveals the all new alloys, speedometer and split seats. Talking about the price of new TVS Apache 200, it is roughly estimated to be around INR 1.5 lakhs. Although the price of 200cc bike is quite high, various sources in TVS have disclosed that the performance credentials of upcoming motorcycle would definitely justify the steep price tag of the bike. Also, the updated TVS Apache RTR180 shall continue to retail in the existing price. The all new Apache RTR 200 would be getting the features like mobile phone charger and also there is going to be Combi Braking System. TVS Motor has also been testing this system on the current Apache RTR 180 and the results are pretty good. 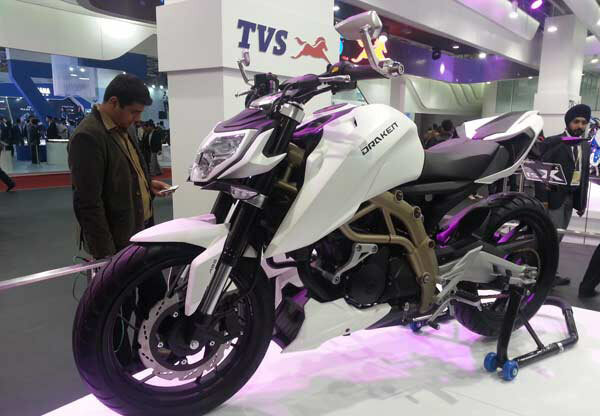 The 200cc TVC Apache would also be getting an ABS (Anti-lock Braking System) and a FI ( Fuel Injection) system. The all new RTR 200 will also come with new Michelin soft compound tires. You can also expect features like clip-ons, digital instrument console to be available on both the models. When it comes to competition, the updated TVS RTR 180 would potentially rival both the new Bajaj Pulsar 180 and 200NS, while the powerful 200cc variant of TVS Apache would take on likings of KTM RC200 and Honda CBR250R.